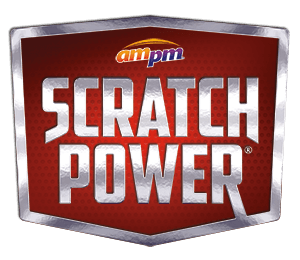 Visit your app store, search "ampm Scratch Power", download and install. Then sign-in with Facebook or your e-mail address, and allow Location Services and Notifications. What operating system should my phone be running? Scratch Power has been built for iOS7.1+ and Android 4.2-6.0. Will Scratch Power work on my tablet? No. Scratch Power has been specifically built for iPhone and Android phones. Scratch Power comes with 3 scratchers that are ready to play. Press the PLAY GAME NOW button to start scratching and start winning. Good luck! Why can't I check in? Double check to make sure your Wi-Fi on your device is on. If you've already done that, try quitting and reopening your app. Why doesn't my ampm participate in Scratch Power rewards? Please email us your contact information and the store address. We will look into it for you! Walk into an ampm, press the CHECK-IN NOW button and 3 scratchers are added. You can check in for more scratchers once every 24 hours. Why have my scratchers disappeared from my Wallet? Scratchers expire after 20 days if they've gone unused. How do I claim an instant prize? Open your in-app Wallet, activate your instant prize and you have 5 minutes to claim it. Pick up your prize, walk to the counter and show your prize coupon to the cashier. How many prizes can I redeem a day? You can redeem up to four prizes a day. My prize disappeared from my Wallet. What gives? Coupons auto-expire after 5 minutes once they've been activated. Most coupons also auto-expire and are deleted from the Wallet after 48 hours if they've gone unused. Please note that some coupons expire the day they are won. I keep winning the same, delicious prize! Why's that? Don't lose hope! Keep playing for more chances to win other prizes! How do I know if I am a winner of the daily and/or monthly drawing? Winners will be notified by email, telephone, or overnight carrier within approximately two days of the drawing. How do I claim a grand prize? Complete your contact details in the app and press the SUBMIT PRIZE CLAIM button. Your eligibility will then be verified and your prize will be sent to you within a few weeks. Grand prizes such as an iPad or an ARCO gift card cannot be claimed in-store. I found an extra coupon in my Wallet. How'd it get there? The ampm genie will occasionally bestow extras on the most loyal of Scratch Power fans. Keep an eye on your Wallet!